Updating sms messaging with richer content like videos, tickets, and other functionalities through RCS, Rich Communications Services. You'd say every company working with mobile messaging would implement RCS right away. That's however not the case. Rich Communication Services (RCS) is basically the standard for the next generation of text messaging, with apps like WhatsApp, Facebook Messenger, LINE and others now offering features that go far beyond the standard SMS-based messaging apps that tend to ship with your phone. Operators are reserved with fully embracing RCS already. The technology that updates sms with richer content and functionalities, isn't new. It was launched back in 2006, but never really took off. Last year however, Google pushed its developments forward after acquiring Jibe, earlier, bringing RCS to the market. The GSMA jumped in backing the plan and started convincing operators to build their own RCS platforms to enable A2P and P2P RCS messaging. The GSMA is convinced that RCS will be the new standard in business messaging and communications. Telecom operator Deutsche Telecom agrees and launched its RCS platform about four years ago and is now fully live with RCS Business Messaging. Among various telecom operators there's a slight distrust in how, why and when to start with the new way of text messaging. One of the largest mobile network operators heard from the GSMA RCS is already live in the country, but de MNO states it has not yet been approached by the GSMA how and why to implement Google's news business messaging tool. 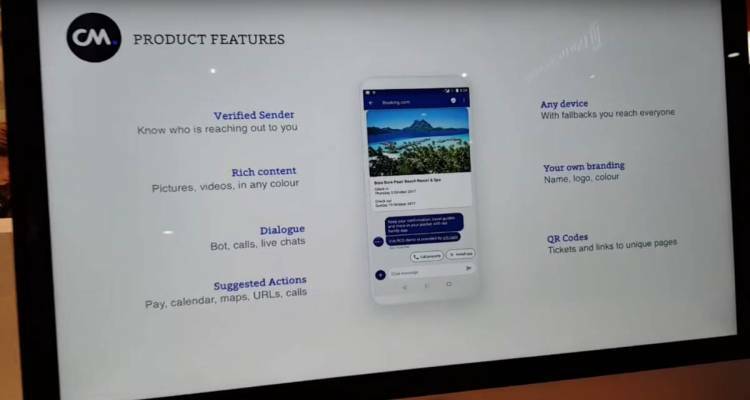 At Mobile World Congress 2018 however, many brands showcase live demos with RCS. Innovation City at MWC in Barcelona hosts four live cases, among them is CM.com presenting a live RCS case with Booking.com. The GSMA and its partners are keen on rolling out RCS worldwide. Alex Sinclair, Chief Technology Officer, GSMA. "We are moving quickly towards RCS business messaging, a new area offering the opportunity for brands to engage directly with their customers in a more interactive way. This is an exciting time for the global RCS community and we look forward to seeing more launches and interconnections in the near future." This year, SMS enters a completely new phase as brands have the ability to roll out Rich Communication Services (RCS) messages to their customers.